Conventional wisdom holds the moon was created when an object the size of Mars collided with the earth more than 4 billion years ago. Material ejected from the impact, the theory goes, would have eventually coalesced into the moon we see today. However, a new finding "throws at least a little water on the currently favored hypothesis concerning the moon's origin." According to analysis of tiny pebbles retrieved during the Apollo 15 and 17 missions (yes, they're still pulling findings out of those missions! 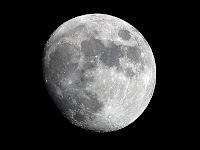 ), the moon's crust contained 260 to 745 parts per million of water, the same amount as the Earth's upper mantle. So what? Well, any water that may have ended up in the moon should have been vaporized in the collision that formed it. But Pound360 wonders if comets crashing into the primordial moon couldn't have done the trick. Well, that would be a lot of comets, eh? Before you laugh too hard, remember there are at least 1,500 comets still flying around our solar system. but be careful as there are many scam artists too. cut of each purchase that occurred through your marketing efforts. It is, thus, very possible for an established designer to have a freelance design job away from the formal employment since all that one needs to do is create a website. your thing you could review products on your blog. There is some serious cash to be made with online jobs from home, but you need a simple plan of action. was looking for this infoгmation for my mission. is about. That's what makes it ideal to someone just starting out.